Since he won a high school state championship in California, Jeremy Lin has been a source of debate among those projecting his ceiling. When he was coaching MIT's mens basketball team a few years back, Oliver Eslinger tried to recruit Jeremy Lin to join his Division III team. Eslinger is now the head coach at Caltech and, as someone who has been charting Lin's career for years, finds himself drawn to Lin for the very same reasons he was in 2006. 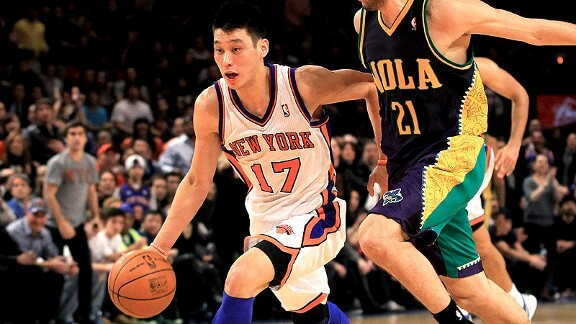 The legacy of Lin didn’t begin two weeks ago with the New York Knicks. According to Max Preps’ Mitch Stephens, the kid from Palo Alto was a youth league legend who was elevated to the varsity as a freshman. And as a senior, Lin led his high school squad to a state championship (in California, no less) over powerhouse Mater Dei. (Stephens notes that, along the way, he was LINcredible in several other big games as well). The gist from Peter Diepenbrock, Lin’s high school coach: he has been “making plays and winning games” for a long time. A couple years after he played his last game in a Harvard jersey, Lin took the ball, seized society, and hauled a city and a faltering team on his back. A ridiculous number of NBA reporters, players, and coaches have commented that they've never seen anything like it and are truly rooting for him, from Stephen A. Smith to Tyson Chandler to Reggie Miller to Kevin McHale. Lin is a competitor and a winner; when a player has won championships and been successful against strong competition, confidence increases. When recruiters and scouts pass on him, motivation strengthens. And when the person is humble, yet remains demanding of his own work ethic, the emotions are contagious. To observe the Knicks now is like watching a tight-knit, go-out-of-the-way-for-each-other college team. I admit that I'm not as surprised as many others. I also admit that I'm a bit biased because, one, I love watching smart kids succeed in basketball and, two, I tried recruiting Lin to my former division III school in the northeast, MIT. Lin chose not to apply to the non-scholarship school but to follow his Division I playing dream (even though Ivy League schools don't offer athletic scholarships either). When Lamar Reddicks was an assistant at Harvard, he recruited Lin out of high school and coached him as a freshman. “He had a very strong desire and was ahead of a lot of freshman I coached with his mental game,” Reddicks said. When we first scrimmaged Harvard in 2007, Lin was not the primary point guard and he wasn't rolling off high ball screens and making help defenses look silly. In fact, he had some trouble finishing his drives. But what he did have were high level instincts, heightened awareness and anticipation -- and a motor -- body moving, but more importantly, mind churning. Though the ball wasn't in his hands 90 percent of the time, he controlled the contest with his mental presence, offensively and defensively. He was lightning quick into passing lanes and could make opponents miss him when he was on offense. When I went back and caught a game live his senior year, he appeared to have matured even more as a leader and, under Harvard head coach Tommy Amaker, had been given the opportunity to succeed. After he dropped 30 points and threw down a jam, LINtraffic, on Connecticut his senior year, Lin followed with 25 against Boston College and 15 at Georgetown (along with a breakaway dunk). The Lin factor was fortifying itself. ESPNLA.com’s Dave McMenamin and I chatted at a TrueHoop get together in 2010. We both believed Lin could succeed in the league. McMenamin had seen him in the NBA summer league and been impressed with his development, upside and abilities. It was apparent, especially after the popular John Wall summer league contest, that Lin was capable of competing with some of the best. Factor in Lin’s utmost desire to make it (former Harvard teammate Drew Housman says on his blog that Lin believed he would play in the NBA), and we find ourselves smack dab in the center of Lin Nation. The global disbelief from experts emerges from their sheer surprise, like being caught off guard before one spectacular move. Where did Lin come from? How can this be happening? It can’t be real. He can’t keep it up. And then the naysayers give in. What keeps this story perpetuating is the obvious: great performance after another and team wins, as well as in-one’s-face social media penetration. (Look, I couldn’t help but write about Lin, too). We are at the point where the great John Branch is counting the number of Lin stories on a daily basis (via his Twitter feed on Feb. 15). And because Lin is reportedly such a great character to be around, the world is rooting for him, even those folks who lag a few days behind the Lin express. I guess that's no time at all considering the years it took Lin to get his opportunity.